If you want to eat fresh salad all summer without having to go to the grocery store this is the post for you!!! I have never had a “green thrumb” in fact, many years ago I tried to have a little flower garden on my patio with container plants. As I transferred plants from a small pot to a larger pots I collected the “worms” that I found near the soil thinking they would be good for the plant. After saving many many “worms” and adding them to the soil, I realized they were actually caterpillars!!! I had just inundated my baby plants with pests that would try and eat all of their leaves. (sigh) The bottom line, if a caterpillar saving expert can plant and grow a square foot garden so can you!!! It’s easy and yields a ton of produce! In 2017, we decided to try to grow an herb and vegetable garden. In Canada the summer days are long but the growing season is short. Which is part of what interested me. Trying out Square Foot Gardening was something I could focus on for a few months, but wasn’t a life-long commitment! Our yard is small so, we decided to try a technique called Square Foot Gardening, which allows you to grow more food in less space. It’s ideal for small yards, patios, and urban gardens. Large yards can of course have the benefits of a Square Foot Garden (SFG) as well. Let’s take a look at what SFG is. Mel Bartholomew, a retired engineer, developed the technique, which became popular in the early 80s. First and foremost, the bed is a raised bed. Meaning, lumber is used to create a box and soil is purchased to fill the box (not earth from your back yard). A 4” x 4” box is customary for Square Foot Gardening. We built a 3 x 13 foot box due to the location where we wanted it in our backyard. 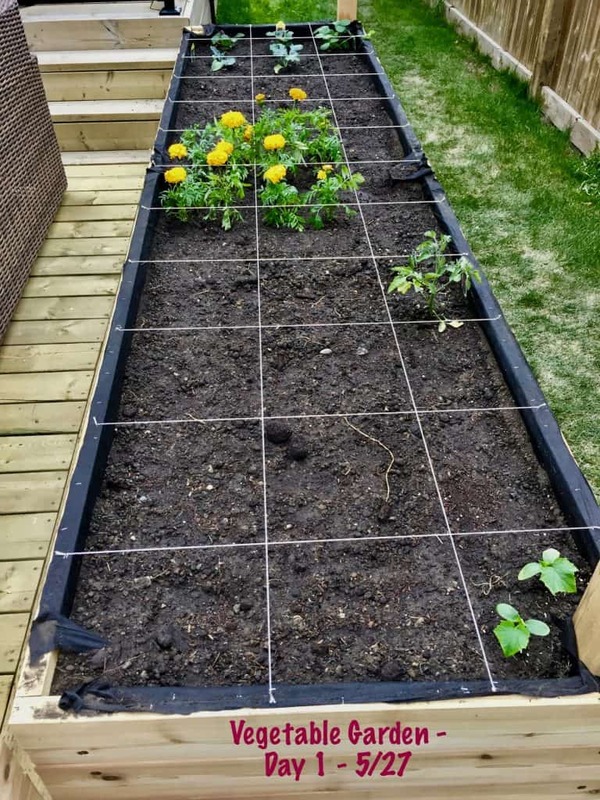 The garden bed is divided into 12’ x 12’ square and has a physical grid separating each square. Bartholomew recommends a specific mix of soils to ensure the it is rich and optimal for growing. Each square, depending on the type of plant, can grow 1 to 16 plants. Square Foot and other gardens bring many tangible benefits to your family. 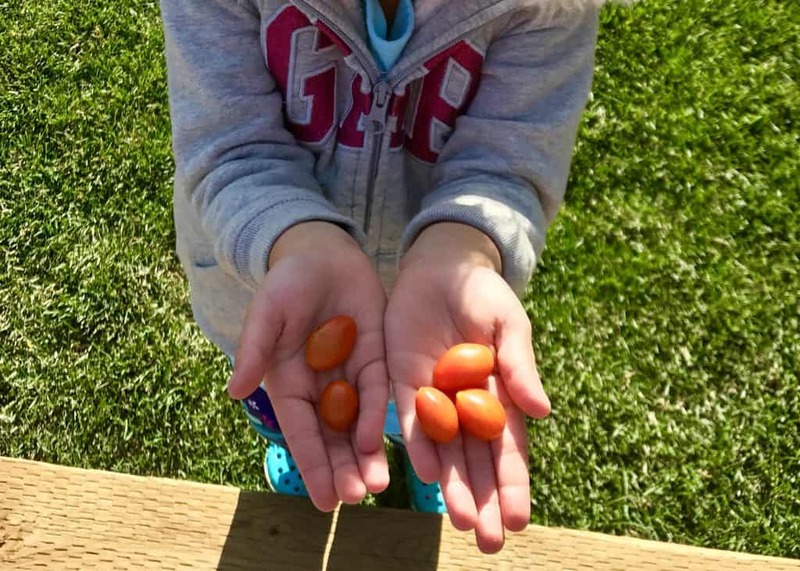 My 3-year-old daughter loved being involved in planting, watering, and seeing the vegetables and fruit grow. Once we had a harvest, she would frequently “steal” a few grape tomatoes and pop them in her mouth while she was playing. She connected with food in a different way and also ate things, like different types of lettuce that she was hesitant to try before. I loved having a fresh salad bar right outside our door. I didn’t have to buy any lettuce or tomatoes for the majority of the summer. 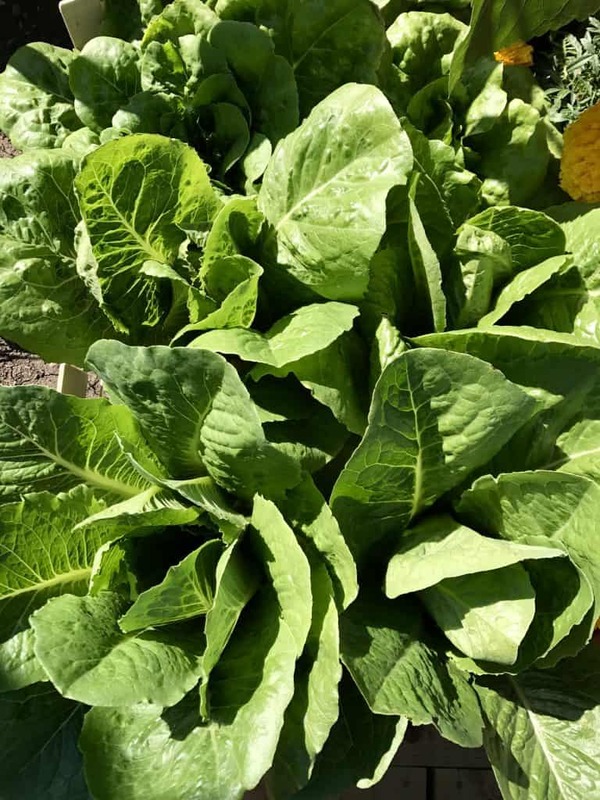 Additionally, we only had to harvest the amount we needed for each meal, therefore we didn’t waste lettuce or salad toppings. Also, the fruit and veggies were much more flavorful. Last but not least, we were able to keep the garden organic and pesticide free. My husband built our raised bed and I mapped out the garden. As I mentioned earlier, we opted for a long narrow bed (3″ x 13″). Our goal was to have the garden as a backdrop to our deck. This made it easily accessible and a part of our summer life vs. something just on the side of our house. 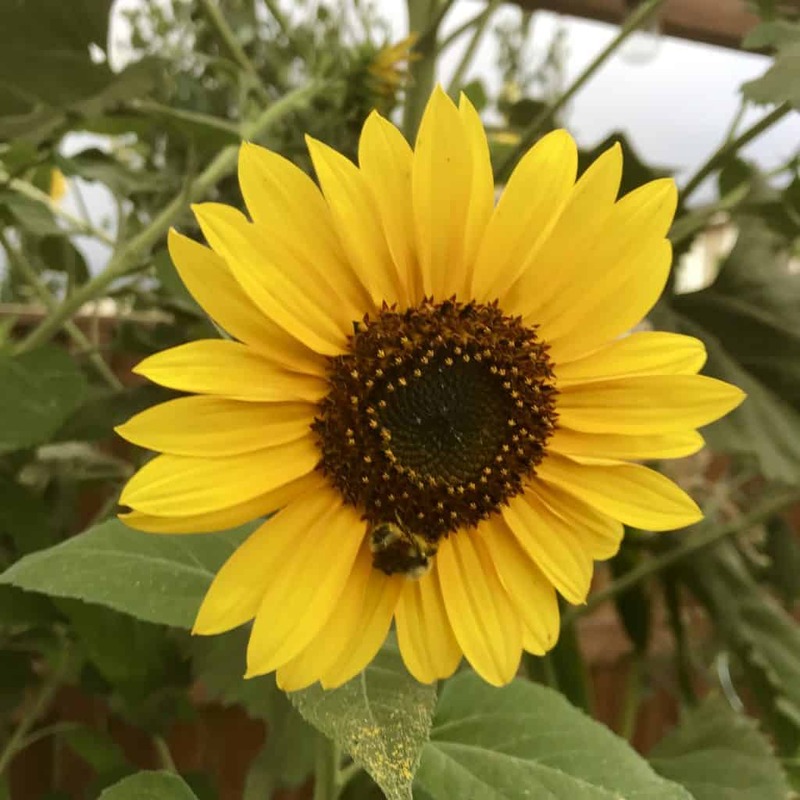 After researching things like good plants for our region, companion planting and the number of plants per square foot, I created an outline of our garden. The majority of plants in our garden were planted as seedlings, we only bought a few baby plants from the nursery. Everything but the garlic yielded produce. There are some things that took all summer to grow (since I started from seedlings.) This year, I’ll start a few indoors in the winter and transfer them outside come summer. While all yielded a harvest, there were some that I wouldn’t do again because they attracted insects or were prone to disease. I honestly fell in love with our garden. Every night I enjoyed watering and being in the garden. It became a sanctuary for me. 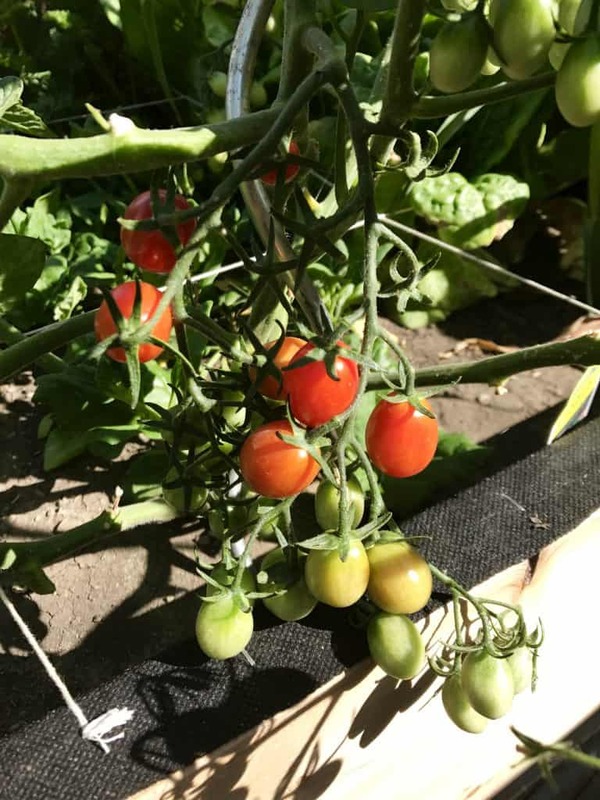 Seeing the produce grow and yield a harvest was so rewarding. The fruit and flowers attracted many bees. The bees didn’t bother us, and in fact, we enjoyed that we were doing our part to help their plight. Sharing flowers from our garden with neighbors was another highlight. Have you considered starting a garden? If you have a small space, I highly recommend giving Square Foot Gardening a try. Even if you have loads of space, Square Foot Gardening is worth considering. Our family found it very rewarding to watch and participate in the process of growing the food we eat. It helps our littles connect in a positive way with healthy options. 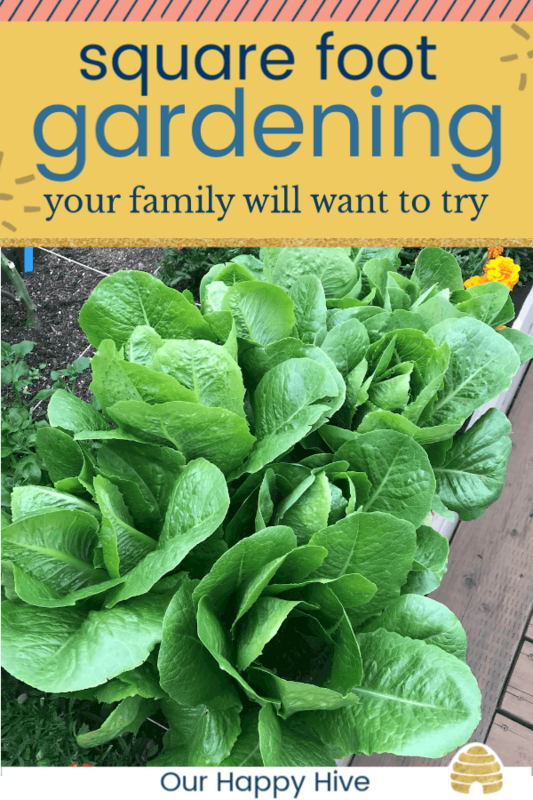 You should take on the Grow Your Own Food Challenge and plant at least one thing this summer. Start with an herb or something local to your area. Try it…you just might like it! Your garden is beautiful! 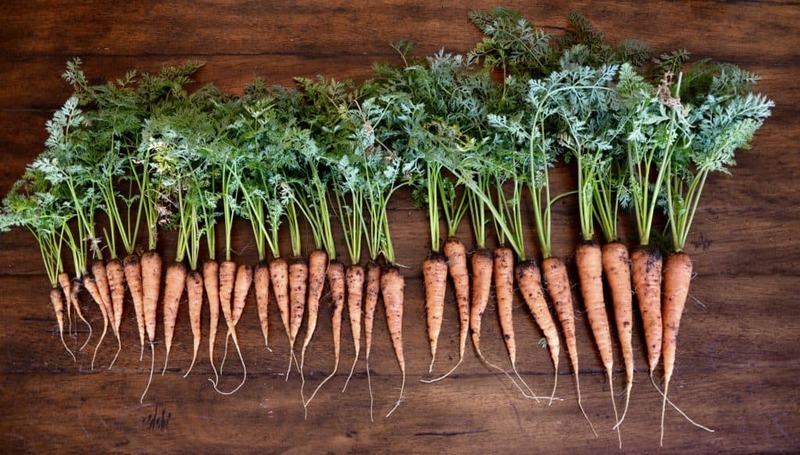 Isn’t it wonderful having fresh produce grown in your own backyard?! My husband built us 3 raised beds and we enjoy growing veggies and strawberries every year. 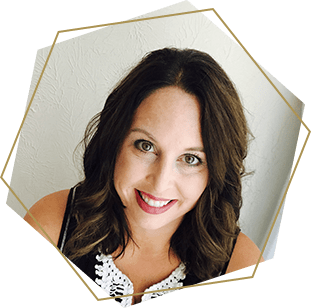 Thanks for sharing this…I’m impressed by your organization! Thanks Lori! Yes, I love that we have fresh produce for part of the year. It’s such a great experience! I think this is a great and very realistic idea! I have a good sized yard, but do not want to take up the whole thing with a garden. I know I can find space for something like this. There is a ton of veggies from this little garden, love it! Your garden is absolutely dreamy!! We have so many squirrels and rabbits in our yard that I haven’t braved having much of one, but this makes me want to find a way! Your garden is so beautiful! Square foot gardening is so cool. I’m glad yours is doing so well! What a great idea! We have 3 acres of land and a huge garden that doesn’t produce because of our poor soil! I might try this! This is so charming! Absolutely love it!! I was just talking about this the other day with my hubby!!! We have said for quite some time we want to do a little veggie garden, I need to share this with him to get him as inspired as I am now!!! I hope you give it a try! It was a really great experience for us! I’ve totally seen those grids in gardens and I had no idea why! This is such a great idea. Ive been meaning to sort out my garden ever sinec I’ve moved in 1.5 years ago and after reading this, I’m determined to get this done this year when the weather warms ever so slightly! 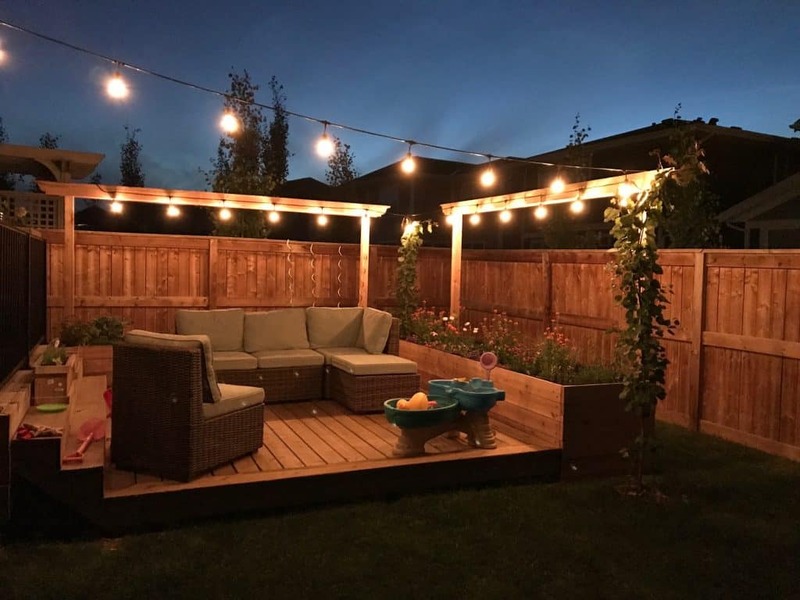 First of all I am loving your backyard set up! I would love to start a garden but I am afraid my precious dog would ruin it.